MOCAP also dip molds vinyl caps, plugs, grips, protective covers and custom parts. Custom tooling can be made quickly and is relatively inexpensive. 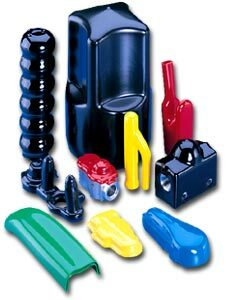 The dip molding process allows for variations in length, wall thickness and color with no additional tooling costs. Standard shapes, sizes and materials are also available. For more information on the dip molding process and its applications visit MOCAP.com.